At first glance, the figures for the first quarter of 2015 turned out to be disappointing: a loss of US$11.1m. with a turnover of US$9.4m. (+ 69% compared with the same quarter in the previous year). However, Plug Power (PLUG, US$2.65) has also succeeded in generating an orders backlog of US$160m. (US$46m. in the 1st quarter, goal for this year: US$200m.). 265 GenDrive systems have been accounted for, while the accounting for a further 419 has been delayed to the second quarter. One H2 filling station has been accounted for while seven are to begin their duties in the second quarter (2014: 10 H2 filling station installation, there are to be more than 15 in 2015). As stated by the executive team during the telephone conference, the turnover is set to reach US$90m. in 2015 (goal: US$100m. ), and support the annual growth target of 40 to 50%. On this basis, despite the apparently “poor” quarterly figures with a high volume, on the day of the announcement, the share increased significantly in value, which is to be clearly evaluated as being a positive sign. Interestingly, certain wholesale investors (funds) can be seen to be active on the purchaser side, and are gradually increasing their holdings in Plug (current filings/announcements). The company recently carried out an America-wide road show (presentation trip, see image) in order to flag up the potential of the company and, of course, to win over new investors for its shares. In my opinion, the executive team will reveal the names of the new major customers (there are rumors that they may include Home Depot, Nike and many more) subsequent to the conclusion of the investors’ trip. A lot has been invested in the development and expansion of the company, especially in the first quarter of this year (which is also the reason for the high reported loss and a liquidity which is over US$10m. lower). 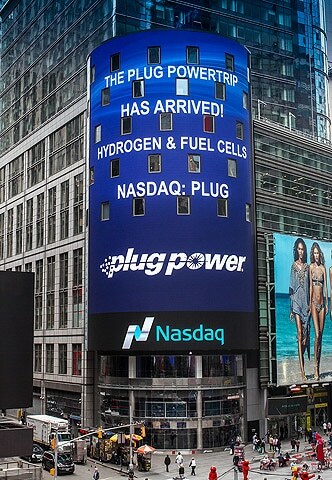 Plug already has more than US$130m. in cash reserves on account. The GenDrive product model can be seen as being a drop-in-power solution. Three product platforms with 70 individual solutions are on offer. The conversion (battery out and FC system/H2 tank in) should be feasible for all of the current forklift trucks which are on offer from the global providers. On the basis of experience, a single battery has an operating time of five to six hours before it then has to be charged again for up to eight hours. According to the details provided, it takes an average of 15 minutes to change the battery. With three shifts per day, this would mean a time loss of 45 minutes. The filling up process with hydrogen, however, can take as little as just two minutes, and is a similar process to filling up a car with gasoline. Moreover, the space requirement for the storage of the batteries and problems related to waste disposal are also omitted. Plug already has customers such as Walmart, which has over 100 sites (logistics centers) and which are set to be converted on a step-by-step basis. A follow up order was received recently from Walmart Canada. A further Big Box customer (Home Depot?) which also has over 100 locations is reputed to have been gained, as well as a major footwear company (rumored to be Nike). To be evaluated positively: over 90% of the existing customers issue follow-up orders, which is to be evaluated as being a confirmation of the business model. It is necessary to bear in mind: if all of the currently available customers were to convert all of their logistics centers to H2 and/or fuel cells, this would amount to potential orders to the value of several hundred million US$. And: orders for two small companies and their logistics centers demonstrate that the Plug business model is scalable downwards and/or is also beneficial for Plug (= massive increase in the basis for potential customers). My bottom line: the current second quarter (June 30th) should bring the breakthrough, since the assumption is of turnover which is over US$25m. According to the executive team, in the first half of the year, 40% of the turnover expected for 2015 has been generated. This would therefore amount to US$40m. a total sum of US$100m. The announcement could take place in July at the earliest (following the conclusion of the 2nd quarter), but is certain to take place in August. The speculation surrounding a very strong quarter (on the basis of the following one) is one of the reasons for the expectation of a substantial appreciation of the value of the company on the stock market as well as the receipt of orders and the conclusion of new orders with leading major companies. In addition to this, more than 30 million shares have still been “sold short”, which could be bought back in the event of rising prices, and therefore present additional potential (squeeze?). The road show which has occurred, as well as presentations and meetings with analysts from leading investment banks allow positive assessments and analyses to be expected. This is certainly a speculative company, but the business model has already demonstrated that it can be a success if you look at its incoming orders. The profit margins are set to increase substantially, which is, among other factors, due to the sale of the hydrogen and the production as a permanent basis for turnover and income. The goal for annual turnover of US$400 to 500m. over the course of the next five years may sound very ambitious, but with the permanent increase in the number of sites for conversion, especially with major customers like Walmart can nonetheless assumed to be plausible. Of interest by-the-by: Benoit Potier, Executive Chairman of Air Liquide (Partner of Plug Power in Europe with forklift trucks), gave a detailed interview in the FAZ on 5/4/2015, in which he highlighted the huge potential of “green” hydrogen (via renewable energies). Air Liquide recently put a system in Dormagen, Germany, into operation which is set to supply the planned and expected H2filling stations. According to the Air Liquide executive team, Hydrogen for forklift trucks as well as materials handling devices are now competitive and clearly superior to the battery. This also constitutes a clear vote of confidence in the Plug Power business model. Every investor should always be aware of their own risk assessment when investing in shares and pay due consideration to an appropriate spreading of risk. The FC companies and/or shares which are stated here come from the area of Small and MidCaps, which means these are not large caps and that their volatility is also significantly higher than such large caps. This report does not constitute purchasing recommendations – without guarantee. All of the data revolves around publicly accessible sources and in terms of the assessment only represent the personal opinion of the author. This analysis was written June 1st 2015.